There's nothing like a steaming hot cup of coffee to jump-start the day. If there's anything better than one cup, it's TWO cups. Well, honey bees like a little caffeine, too. Scientists at the University of Haifa, Israel, found that bees prefer nectar with a small concentration of caffeine and nicotine over nectar without those substances. 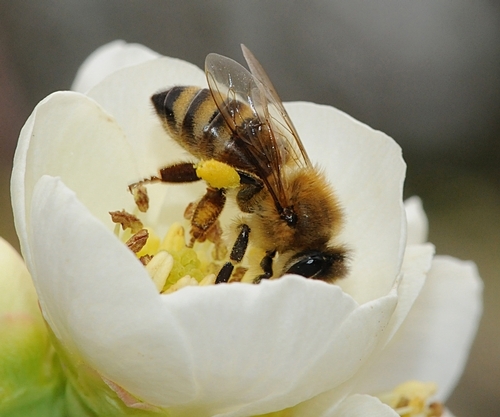 The bees like the amount naturally found in nature and not at the higher, more toxic levels. 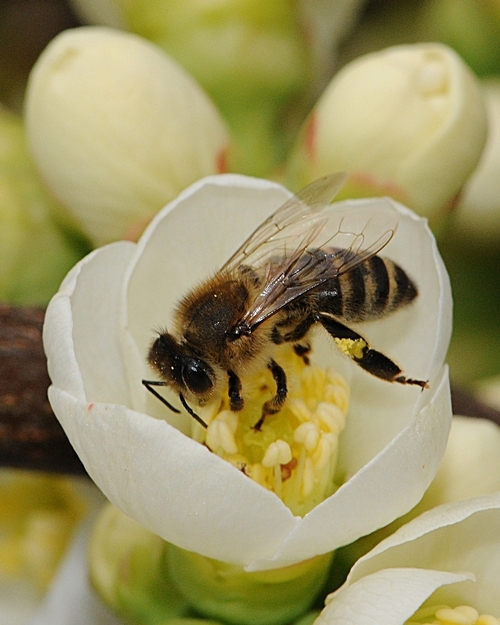 A news release posted on EurekaAlert noted that the bees "clearly" favored the blossoms that gave them a little buzz. What's caffeine and nicotine doing in flowers, you ask? Did someone pour coffee or stub their cigarette in the blossoms? No. Some plant species naturally have a little caffeine or nicotine in their floral nectar. "Nicotine is found naturally in floral nectar at a concentration of up to 2.5 milligrams per liter, primarily in various types of the tobacco tree (Nicotiana glauca)," wrote communications specialist Rachel Feldman of the University of Haita in her news release. "Caffeine is found at concentration levels of 11-17.5 milligrams per liter, mostly in citrus flowers. In the nectar of grapefruit flowers, however, caffeine is present in much higher concentrations, reaching 94.2 milligrams per liter." What the researchers did was offer "clean" nectar (comprised of just sugars) and artificial nectar (comprised of various natural sugar levels, coupled with various levels of caffeine and nicotine). The bees honed in on the spiked nectar. It's important to point out, however, that the study proved a preference, not an addiction. And yes, the next step is to study whether the bees can become addicted to the substances. Honey, would you like a little sugar in your coffee, or a little coffee in your sugar?